Cosmic Gathering is our women only invitation to connection and self care brought together by Candace of Lovely Woods press, Michelle of Cosmic Bath &Beauty, and Myself. Our fall gathering was a beautiful pause to the autumn season for an evening of spiced and spiked drinks, fall flavors, and an opportunity to support local female entrepreneurs while spending time with old friends and connecting with new ones. 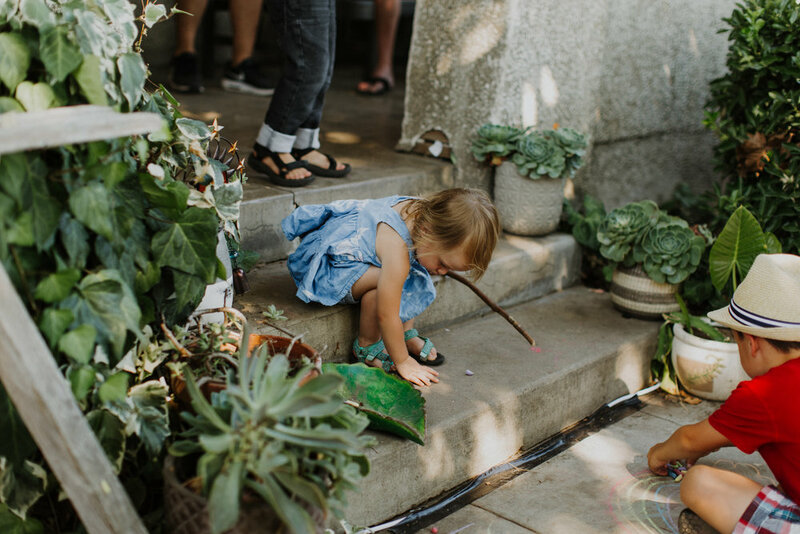 Offerings included fall flower crowns, portraiture, tarot readings, hand scrub bar, vintage dresses, crystal jewelry, henna, live typewriter poetry, sourdough specialties, and artful creations. Here are some behind the scenes photos by wonderful Marilyn Days Photography, I hope they entice you to attend our next gathering in the spring and to follow some of these local female powerhouses. Chelsea America our portrait artist warming up in her beautiful vintage chairs. Felicia of The Rad Vintager setting up delicate dresses. Tarot reading with Lili of Black Moon Healing. Christina of Moonlit Substance setting up her display. Michelle of Cosmic Bath & Beauty offering hand scrubs and warm hugs. Sophia, Gillian, Lili, Candace, Michelle, Bonnie, Brook, Felicia, Gigi, Christina, Stella, Chelsea. Poets, card readers, carvers, soapmakers, bakers, artists, curators, handcrafters, writers and painters. The makers of Cosmic Gathering magic. All photography by wonderful Marilyn Days Photography. Alchemy Bread would be nothing without our community. Customer Scrapbook is an ongoing collection of the special people who make our world vibrant. It's my pleasure to use this installment to introduce you to my regular customers and dear friends Liz Schuiling and Sarah Darpinian of Oak Valley Youth Garden. Liz picking up bread at Thursday Friendship Bake. Sarah with scones she baked and flowers she grew. Sarah and Liz together run the Oak Valley Youth Garden project. This free children's program offers gardening twice a month on Thursdays, where young people can learn about the work involved in growing food at the Ripon Community Garden space. This hands on learning is a valuable asset to our children and a beautiful introduction to the natural abundance of our region. Learning the ongoing process and seasonal ebb and flow of different flora is an invaluable lesson to learn early and connect to the care and stewardship of our local resources. Children working in the garden. Each gardening day includes a special lesson, a handcraft for older children and a storytime for younger ones. Creative and thoughtful lessons and crafts have included making leaf lanterns out of mason jars, learning about heirloom seeds, making fresh butter, and even a little sewing project! Sarah teaching a gardening lesson. Sarah and Liz put plenty of their own unpaid hours into this program to make it free and accessible to all children. They purchase the plants and seeds, craft materials and supplies for the garden. All the produce they grow is donated to the Gospel Mission and the St. Vincent De Paul food pantry to provide fresh vegetables for meals to those in dire need. One way that they raise money to support their efforts is with a fundraiser. This year they are offering locally hand printed market totes featuring their beautiful new logo. Oak Valley Market Tote bag. Locally designed and handprinted by Lovely Woods Press. Please consider supporting this wonderful organization and putting down roots in your local community by purchasing a tote, which will look wonderful carrying all your produce at the farmer's market. Purchase a tote by commenting on their facebook page or emailing oakvalleyyouthgarden@gmail.com. Want to learn more or interested in attending a gardening session? Please find your friendly neighborhood green thumbs Liz and Sarah by following the links below. Need a gorgeous logo designed for your small business or local organization? Need bags or shirts printed for your next event? Please reach out to Candace of Lovely Woods Press for a hand drawn original piece of art, hand carved, and hand printed that you can be proud of. Ditch the clip art logo and set yourself apart as a true original. Find her by clicking the link below. Customer Scrapbook is an ongoing collection of the Alchemy Bread enthusiasts who make our community vibrant in unique ways. I'm happy to use the third installment to introduce you to Candace Jenkins, the jane-of-all-trades behind Lovely Woods Press. If Candace already looks familiar to you, you've likely seen her running the pastured and organic eggs booth at the downtown Modesto farmer's market. She spends her days in muddy boots doing farm work, collecting eggs and caring for free roaming hens. The first thing that you'd likely notice about her is her easygoing demeanor, folksy charm and wry wit. A wanderer and a dabbler, talking to her is a pleasure because she has so many endeavors under her belt. She spends her free time venturing in the wilderness, gardening, playing guitar and working on her archery skills, but first and foremost she's an artist. Her personality shines through in the whimsical but rough hewn style of her art. Wildflowers, antlers, arrows and oak leaves reflect the sense of wilderness present in her prints and carvings. She created a custom stamp from my artwork for my bread packaging. Candace is a thoughtful listener,easy to trust, and a pleasure to exchange creative ideas with. Aside from carving beautiful logo stamps for the discerning brand that wants that authentic handcrafted feel to their identity, she creates rustic and primitive wall art from reclaimed wood. Thank you Candace, for making the valley a little more beautiful just by being your wild, warrior, huntress, animal guardian, self. Follow along with Candace to keep up with her adventures and artistic offerings.